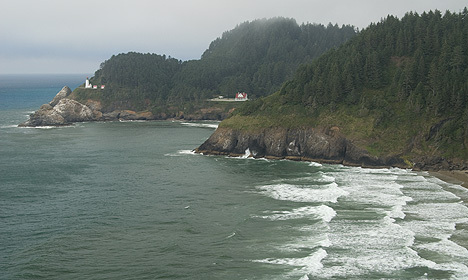 Florence, Oregon is best known for the massive sand dunes that stretch southward to Reedsport. The Oregon Dunes National Recreation Area borders the town of Florence and is the largest expanse of coastal dunes in the country. Hundreds of miles of trails snake between Florence and Reedsport, creating an ideal location for hiking, dune buggy riding and playing. Florence is also home to the Oregon Coast's annual Rhododendron Festival, the third-oldest of its kind on the West Coast. Live music, 5K and 10K runs, classic car and gun shows and the Queen Rhododendron Pageant and Coronation take place during the three-day May event. Like its neighbor to the south, Florence is a magnet for fishing enthusiasts. Its proximity to the Umpqua River and several well-stocked lakes makes it a popular base for weekend fishing trips. Alder, Sutton and Dune Lakes feature excellent freshwater fishing. The town also has a well-positioned harbor and several charter services. Approximately 10 miles north of Florence are the Sea Lion Caves, the West Coast's only mainland home for Stellar sea lions. Visitors can take a trip to the sea lions habitat some 200 feet below the observation deck. Florence's carefully restored Old Town area includes several historical museums, as well as a selection of coffee houses, stores and restaurants. Visitors can learn about early Native American history and view pioneer relics at the Siuslaw Pioneer Museum. A nearby private museum also displays more than 3,000 unique and restored dolls. Oregon's expansive sand dunes provide just the right amount of challenge for a good game of golf. There are a number of public and private golf courses within an easy drive of central Florence. Oregon Coast's temperate weather makes it possible to play golf just about any time of the year.